They were books about the Jamestown flood, the Donner party, elephant hunting in Africa, and the chemistry of a lemon. 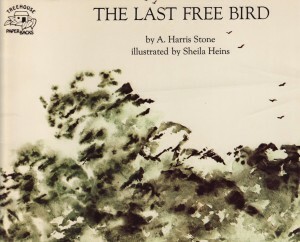 Some of those books—such as THE LAST FREE BIRD—were written by my father, an education professor who also authored a bunch of children’s science books in the 60s and 70s. I don’t recall that as being something I was particularly impressed with; rather it was a matter of fact. One of thethings he did. And by extension, something that was simply possible for a person to do. When you grow up around books and by extension, discussions of books, you becomea literary person. When you are asked to bring a new word to the dinner table, or a topic to the breakfast table—and both of those meals are had together with conversation, you become a literary person. I didn’t conceptualize any of that as life changing. But it most certainly was.